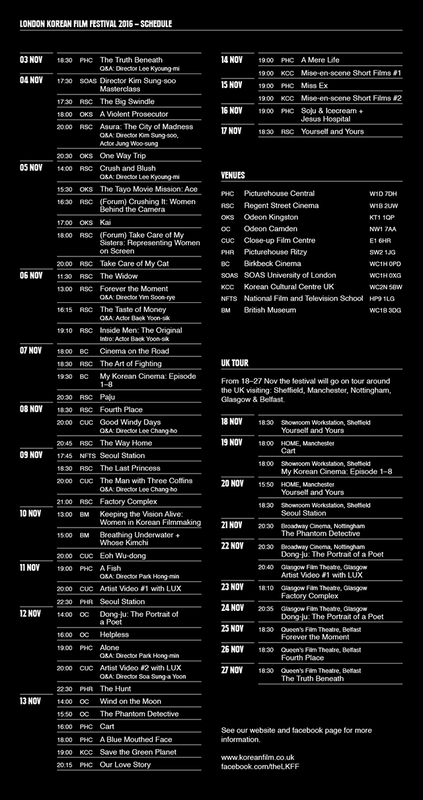 The 11th London Korean Film Festival (LKFF) will run from 3-17 November in London followed by a tour around in the UK (Sheffield, Manchester, Nottingham, Glasgow & Belfast) until 27 November, with over 60 films across features and shorts, a host of UK & European Premieres, Hits, Retrospectives, Animation, Documentary, and this year’s special focus on women directors. 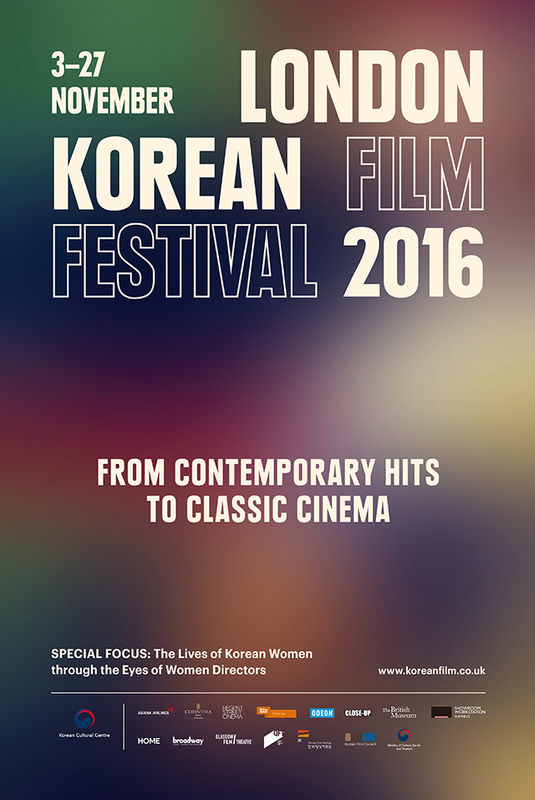 With special guest actors and directors from Korea, film intros, Q&As, giveaways and more, don’t miss this fantastic opportunity to discover the very best in Korean cinema. See you in November! 2016 런던 한국 영화제가 런던과 영국 지방 5대 도시 (셰필드, 맨체스터, 노팅엄, 글래스고 그리고 벨파스트) 에서 11월 3일부터 27일까지 개최됩니다. 개막작 (비밀은 없다) 부터 (아수라), (동주), (위로공단), (덕혜옹주), (여성감독 특별전), (아티스트 비디오) 그리고 폐막작 홍상수 감독의 (당신자신과 당신의 것) 까지 2016년 한국 화제작, 애니메이션, 다큐멘터리, 고전영화, 아티스트 비디오 등 다양한 한국 영화를 영국에서 만나 실 수 있습니다. 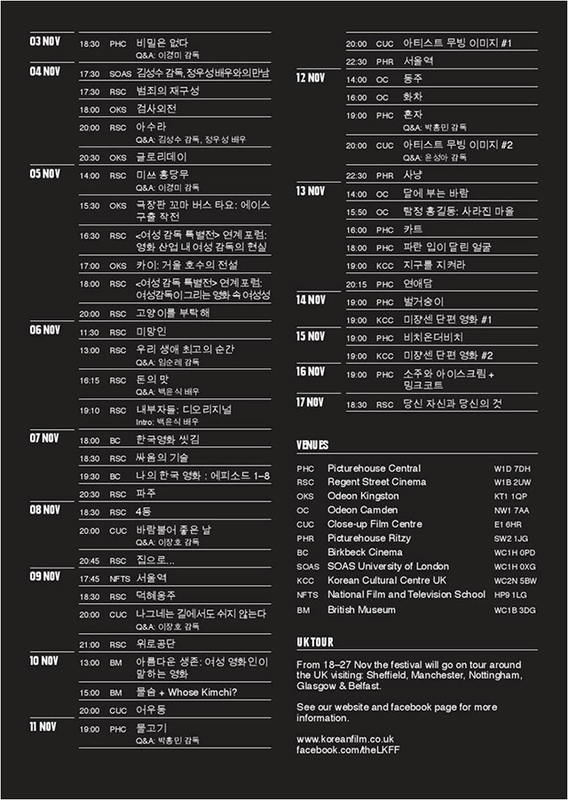 그리고 의 이경미 감독 Q&A, (우리생애 최고의 순간) 의 임순례 감독 Q&A, (아수라)의 김성수 감독님 정우성 배우와의 만남, 백윤식 배우와의 Q&A 등 다양한 행사 또한 가질 예정입니다.